The RKG series of machines perform various tasks in an entry door line, such as door tilting and brick mold application. These machines can be mixed and matched to suit your company’s machining needs. The RKG-1 Assembly Station assembles steel, fiberglass, or wood doors with sidelights, patio doors, or double doors. Its design eliminates the manual lifting and turning of the doors during assembly. It receives a door panel with the hinge jamb or mull post attached, exterior side up. For double doors the left-hand door panel is prepared and rolled into the machine. The panel, with the jamb attached, is then rotated 90 degrees counter clockwise and lowered onto non-marking polyurethane wheels. These wheels are positioned to support the door on the top and bottom rail, providing clearance for door light frames or raised molding. The second door, with the jamb attached, is then rolled into the station, rotated, and positioned next to the first. The pair are then lowered onto jamb support plates. Two operators, one working at the top of the door and one at the sill end, simultaneously install the head jamb and sill. A clamping system holds the components in place so they can accurately fasten the head and sill to the side jambs. After the frame has been assembled the door is raised with the polyurethane rolls so that it can be safely moved to the next station. The RKG-2 Brick Mold Station is for applying exterior casing to steel, fiberglass, or wood door with side lights, patio door or double doors. It is designed to receive an assembled door from the RKG-1 on non-marking polyurethane wheels that supports the doors on the top and bottom rails. After the door is received it is lowered approximately 5” and set onto support plates to secure it. The lowered height makes it easier and safer for the operator to apply the outside casing and any required packaging. This includes a skid board to protect the sill from damage. The RKG-3 Tilt Up Station is designed to raise assembled entry door from a horizontal to a vertical position for feeding into the RKG-4 Upright Clamp Conveyor. This station is designed with non-marking polyurethane wheels to support the door on the top and bottom rails. The wheels are positioned so door light frames and raised moldings will not be damaged. There are also rolls on the sill support plate. These wheels enable one operator to safely and easily move the door to the next station. The tilt table utilizes a hydraulic tilt cylinder, electric pump, and foot switch for control. The RKG-3A Upright Conveyor is used to receive a door after it has been raised to a vertical position by the RKG-3 and align the door with the RKG-4 Upright Conveyor. The RKG-3A is required when entry doors up to 9’ wide are to be fed into the RKG-4. The RKG-3A may be used as a work station to install caulking in the sidelight frames and to set the sidelight panels into the frames. The RKG-4 Upright Conveyor makes easy work of installing sidelight panels in steel, fiberglass, or wood doors with sidelights, or patio doors. 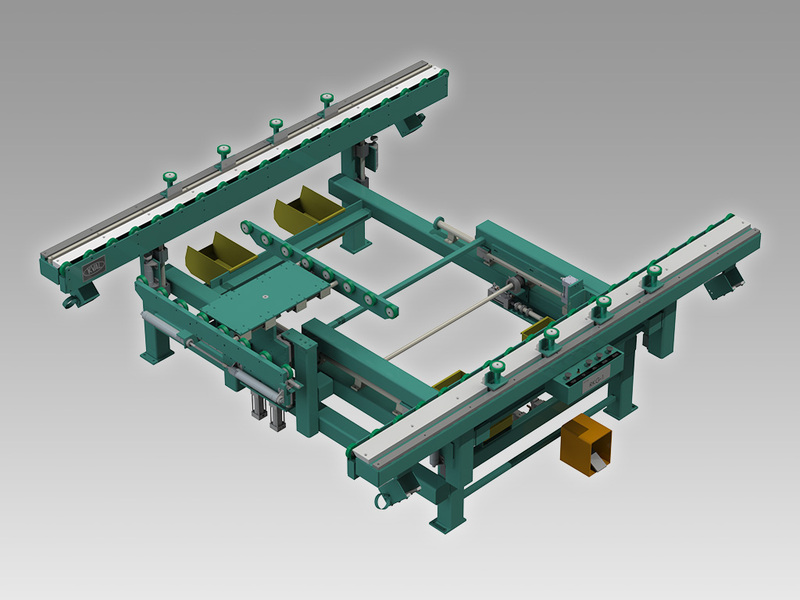 The RKG-4 is designed to receive assembled doors in a vertical orientation from the RKG-3 Tilt-Up Machine. The door is tilted all the way up and over to 6 degrees past vertical so the unit is leaning on the exterior side. In this position the door is easily rolled to the clamp station. At this station the door is clamped against a fence that holds the door vertical so the door can be opened. The RKG-4 is also equipped with a momentary sill clamp release, so the frame can be squared to the door before the sidelight panels are secured. This ensures that the frame will be square after the sidelights are installed. The RKG-4 is also equipped with a special clamping system that will press the sidelight panels into the sealing compound. The clamps are air-actuated and are controlled by a single push/pull valve, enabling one operator to easily and safely install each sidelight panel. After the panels are seated, the operator can open the door to secure the sidelight panels through the mull posts. After the sidelight panels have been installed, the door is unclamped so it is leaning against the brick mold. In this position the door can easily be rolled to the next station.